The Galloway Pippin is a heritage variety of apple originating right here in the Galloway region of south west Scotland. It would appear that the variety was first recorded in Wigtown, which is now Scotland's national book town, just a few miles from Frugaldom. 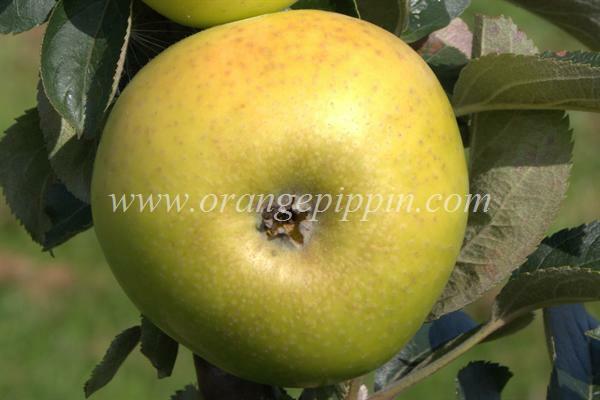 According to our supplier, Galloway Pippins were first recorded in 1871. It is a dual purpose apple with a rich flavour that keeps its shape when cooked, making it ideal for pies and tarts (see our blog for recipes). Cropping is good and the tree is very hardy, making it well suited for exposed areas. We have selected this variety of apple tree to plant in the new orchard, as part of our Galloway heritage project. Other species will be incorporated and we already have many crab apple trees, including the tiny Siberian Crabs, which resemble cherries on the trees. We would like to have a small feature orchard based on this local variety so that, once grown, the apples can be made available locally from our on-site Trading Post. The Galloway Pippins are self-sterile, so we need a second species in the orchard for cross-pollination purposes. For now, we have our hardy crab apple trees, but we will keep adding to the collection. As a heritage variety, the trees command a premium price. For this reason, we are seeking sponsorship from any interested parties who may like to support this project or donate towards the cost of buying, planting and caring for the trees. We have managed to source 25 trees to start our new orchard. These should be delivered mid February 2016 from www.adamsappletrees.co.uk/ - photos to follow. If you would like to sponsor a tree, please see the ' Sponsor a Tree ' page.